On Saturday, Josh went snowboarding with his friend. I wasn’t invited, not that I wanted to go, I hate the snow, cold, and scary, steep mountains:) I have tried skiing twice, but I am not a fan. I prefer to stay inside where it is warm. So I spent the day cooking and baking-that is my idea of a good time. I wanted Josh to come home to something hearty and warm, so I made a black bean sweet potato soup. We love black bean soup at our house. We have a couple favorite recipes, but I wanted to try something new. I had a large sweet potato lying on the counter and decided to throw it into the mix. It turned out to be the shining star in this soup. It gave the soup great color, texture, taste, and added nutrients. This soup is very filling, but in a “good for you” way. I made a large batch so we could freeze half of it for later. I am glad I did because I am already wanting more:) Josh loved it too, it was the perfect post snowboarding meal. 1. In a large soup pot, heat the olive oil. Add in the onion and cook until tender. Add in the garlic and cook for about 2 minutes. 2. Stir in the sweet potato and roasted red pepper. Cook for 5 minutes. 3. Add in the broth, water, black beans, and tomatoes. Stir well. 4. Add the chili powder, cumin, and red pepper flakes. Stir and toss in the cilantro. Stir again. Let the soup simmer on medium low for 30 minutes, or until the sweet potatoes are soft. 5. Season with salt and pepper and serve hot. 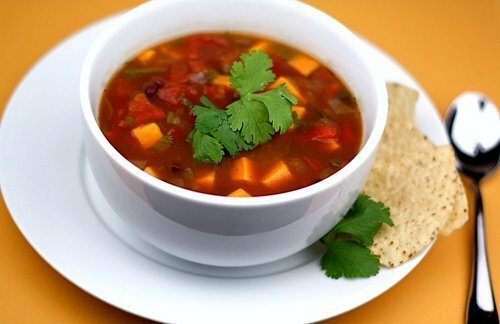 Black bean soup is one of my favorites! I love the addition of sweet potatoes! A lovely soup! I’d love some of that now! black beans and sweet potatoes just sing together! yum 🙂 and i’ll be with you in the kitchen instead of on the slopes! I am a snowboarding/skiing scaredy-cat as well! I’m too afraid of all the thigns that could go wrong…like tearing my ACL. Then I would never be able to run again, which would be the worst thing ever. I’d much rather cook. What a gorgeous colored soup! I’m sure it has tons of flavor too! I love black beans and sweet potatoes. This is right up my ally! This looks wonderful. For diabetics out there (and others needing nutritional info), I did a quick analysis. 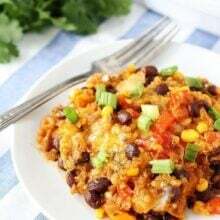 Assuming this recipe makes 6 servings, each serving is 282 calories, 4g fat (1g sat), 0mg cholesterol, 1729mg sodium, 51g carb, 17g fiber, 4g sugar, 15g protein. I’ll definitely be giving this a try! So pretty Sweet potato is wonderful in so many things, isn’t it? I would love to try this without the tomatoes though. I wonder what else I could use? I’m a huge fan of sweet potato and beans. 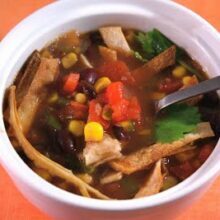 I agree with you about the use of black beans in soup; such a perfect ingredient and so many variations that can go well together. I love the addition of sweet potato. Believe it or not, at one time I was a skier. I won’t say I was ever one of those people who would go in any weather, but I did like it when the sun was out. Now skiing doesn’t sound nearly as fun as staying home! Healthy, colorful and delicious – my kind of soup! Mmmm, I love sweet potatoes! Sounds like a great soup. the colors in that soup are gorgeous! i’ve never thought of adding sweet potato to my black bean soup but sounds delicious. you should enter this recipe into @SheSimmer @GourmetFury’s Beet n’ Squash you competition- this month’s veg is sweet potato! Mmm. Looks delicious. I think I even have all the ingredients. I think this will be dinner tonight. Yum! I love sweet potatoes – such a delicious and nutritious veggie. Beautiful soup! I’d love to be on the mountain for sure, but coming home to a nice warm bowl of soup sounds perfect! Wow, how beautiful and it sounds so good! I could really use a bowl of this right now! Mmm, I love soup and am so bummed that my husband doesn’t care for soup. Oh well, I made chili last night anyway. Love the idea of sweet potatoes! that looks delicious! I love b-nut squash and beans together in a soup form!! 🙂 it is also beaitiful! Lovely soup. I love sweet potato in pretty much anything. BTW..snowboarding scares me too! i’d love to come home to this after a day of falling on my tush. 🙂 love the colors and flavors, maria–well done! I love the idea of sweet potato in this soup. It sounds so satisfying and perfect for the rainy weather we have right now! What a colorful and healthy soup, Maria! I’m sure Josh was grateful for a bowl of this after a day of snowboarding. 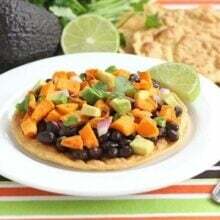 Sweet potato and black beans are a great marriage. Would be good with a little yogurt in it too. I read our yogurt post and I’m persuaded to get a yogurt maker now. What a hearty and comforting soup! 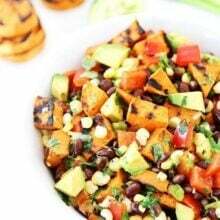 I love sweet potatoes and black beans together, so this is right up my alley – yum! I love black bean soup, but it can get a little flat at times. The addition of sweet potatoes is brilliant. I will definitely want to try this. I love soup…I’d eat it every meal of every day if it wasn’t a freakish thing to do 🙂 This looks delicious–I love all these flavors, especially the cumin. Yum! It looks wonderful, Maria. Such a warming treat to come home to. I’m sure he loved it. I love how you combine ingredients that I would never have thought of! This looks wonderful! Sounds great! I’m no big skier either. I like to cross-country, but I’m scared of downhill. This is likely the result of my hair getting caught in a ski lift as a kid! Delicious, very colourful – I have some leftover black beans..
We grow sweet potatoes and they are the best in soup and chilies. So glad my kids eat them. Oh, I bet the sweet potato is wonderful in this! One of your other black bean soups has been a go-to for me, so I can’t wait to try this one! 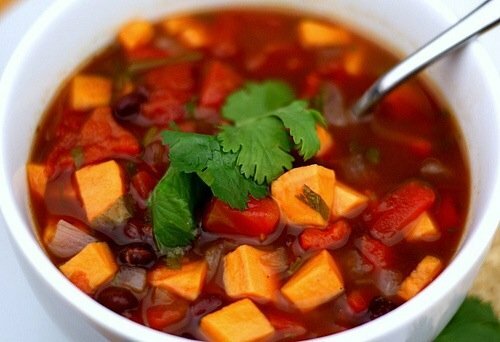 I love black bean soup… and the addition of sweet potato is brilliant. I will definitely be giving this one a try. 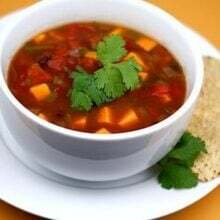 We love black bean soup and the added sweet potato sounds so good! Just found a pizza that had black beans sprinkled on top which sounded so good to me!!! I made a sweet potato soup, last night. I wish, I had seen this first.. I love the way you spiced this up. I must try this. I am having a giveway for cookware, if you are interested. I’m still craving soup even though the weather has been decent. This would hit the spot! Cara-I will try winter squash next time. Thanks! This looks fabulous! I love black beans and sweet potatoes and am now actually happy it’s cold and rainy out so I have an excuse to make this soup! Glad I found your blog via This Week for Dinner … look forward to more recipes. I made this last night. It was so delicious and I was shocked that I had every single ingredient on hand! I had just returned from a road trip and was so hungry — i wanted something warm, healthy and filling. It was perfect. I topped with fresh cilantro and a dollop of sour cream. Best part about it? Since there are only two of us I have leftovers for lunch today! Made a batch of this over the weekend. Turned out great! I went with 5 cloves of garlic instead of 2, but I’m a garlic fiend. I added a little more chili powder too, but I eat a lot of spicy food. This is definitely getting into my regular rotation of soups. looks awesome! going to make right now. thank you. I bet this tastes so incredible! There’s nothing better than a fall-flavored soup on a chilly day, and this will be just the ticket for dinner this week. Thanks for sharing, Josh and Maria! I made this last night..Added an extra sweet potato, and put in only 2 cans of tomatoes instead of 3 (and it was more than enough). In afterthought, I would have added another can of black beans. I topped it with a little sprinkling of cheese and a handful of chopped cilantro. This was absolutely amazing!!! Very filling, inexpensive, and healthy. My boyfriend who does not really like sweet potatoes had a whopping four bowls and said it was the best soup he had ever tasted…and he loves soups. Annie-I am glad you both enjoyed the soup! I made this soup tonight and it was delicious and very filling! I made this tonight, forgetting the cumin and chili powder and it was delicious! It totally impressed my guest and made me look like a great cook. Not bad, considering I forgot two spices…. Wonderful recipe; thank you for sharing! I made this last night and it was sooooo good! Even my friend who, as a rule, never gets a second serving, went back for more!! Just made this soup tonight. I was completely wowed by how much it made, and am looking forward to hearty and delicious leftovers all week! I topped it with a big dollop of Greek yogurt and was SO glad I did! Thanks for a great recipe! I guess I am the only disappointed mom here. The taste was good but it was way too spicy for my little ones! I love spicy but this would have resulted in tears if they ate it! Going to use less chili powder next time and 1 or 2 cans tomatoes without chilis. Maybe I’ll get lucky with the next batch. I just made this soup. Yum yum yum! Thanks for this great recipe! Thanks for the recipe! We loved this one! I LOVE this soup! Such a great combination of flavors, plus it’s filling and healthy. I make it several times a year – tastes great right off the stove, but it also freezes well. Wish it was winter now, as it tastes even better in cold weather. So I am new to the cooking game. This might be a stupid question, but do I cook the sweet potato first? No, you don’t need to! About how many, please, would this great-sounding soup recipe feed? Thanks!